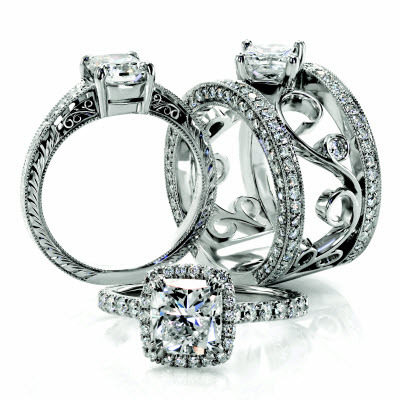 Knox Jewelers has been creating engagement rings in Minneapolis since 1984. Everything you see on our website and in-person at either of our Minnesota jewelry stores is made right in our Uptown production studio. We like to think that we have the nicest designs around town. You won't find our unique engagement rings anywhere else in Minnesota because we are the designer and manufacturer. Artist and maker. That's right, made in Minnesota, by Minnesotans. We are designers and we are craftsman. We believe in creating pieces that will last a lifetime. We are in the business of making heirlooms and we can custom tailor our designs exactly how you want them. 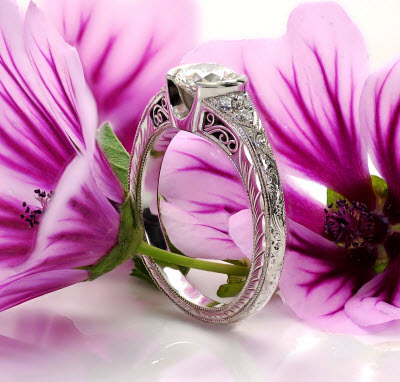 We have hundreds of happy engagement ring customers all over Minnesota and thousands more across the globe. A designer engagement ring shouldn't only be about design. It should be made to last a lifetime and it should come with a lifetime warranty. Engagement rings shouldn't be mass produced. They shouldn't be hollowed out and light as a feather. They have to be created by the hands and expertise of a master craftsman. You should never have to settle for a showroom model that has to be sized to fit your finger. Quality jewelry needs to be made in your finger size from the start. It also needs to be made precisely for the center stones that they hold. Things like this matter to people who want an engagement ring to last a life-time. Our master craftsmen have spent their lives perfecting the art of jewelry design and manufacturing. They are some of the best in the world at making jewelry. Alongside the experience and talent at Knox Jewelers, our staff utilizes start-of-the-art equipment and each bench is equipped with the industries latest and greatest tools. While these tools help us in the manufacturing of your engagement ring, the passion our staff has for heirloom quality engagement rings is what makes them and their creations the best in all of Minnesota. 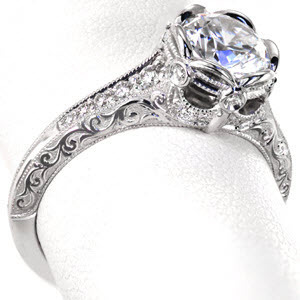 We feature hundreds of different styles and fashions of engagement rings on this site. From halos, to filigree, to our antique line that features hand-engraving and milgrained edges. 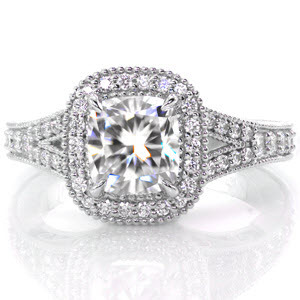 Because we are designers and manufacturers, our custom design engagement rings are Minneapolis' best. Starting from a sketch or using elements from existing pieces, we are the experts are bringing your dream ring to life. Whether you go with a custom tailored piece or something out of our production line, you can follow us along the creation of your heirloom with photos updates arriving via email. Our Minneapolis jewelers and production team take pride in what they do and we share their work on your piece as it's being made. We recommend our rings be made in 950 Platinum Ruthenium as this alloy gives the best scratch resistance and durability across all precious metals used in jewelry. Our gemstones and metals are guaranteed to be conflict free and our processes use recycled materials as we believe in the green initiative. From the proposal, to your wedding day, and for the rest of your life, Knox stands behind your diamond and ring. Oval diamonds are the most popular fancy shape this year, taking over for the Cushion cut which has held the honor since 2011. It's the perfect shape for this flaring vintage-styled setting as everything points towards the center piece. The alluring stlye of halo engagement rings have been a very popular look for the last decade and the demand is still growing! Customers are finding it practical to go with this style because it helps make the center stone look larger and it gives the setting some unique detail. This halo in particular happens to be one of the nicest you'll find in all of Minnesota! 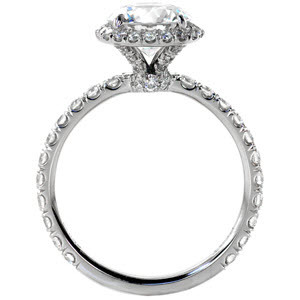 Our Riviera design features a thin U-cut micro-pave ring of diamonds around a claw-set 1.50 carat round brilliant. All the diamond settings are cut in Platinum by hand. This is the only way to get a minimal amount of prong over the stone to yield maximum sparkle, while still being secure. Hand engraving is the quintessential element in any high-end custom piece of jewelry. For 2016, Knox Jewelers will be releasing several pieces with the relief style in our Hand Engraved Engagement Ring collection. Petra is our first and shows a beautiful relief scroll pattern on either side of the shank. Most people will find this style of engraving the most pleasing to the eye because of the contrast between the pattern and the stippled background. The design encompasses a .75 carat round in a unique setting flanked by six bezel-set diamonds surrounded in milgrain sashes. 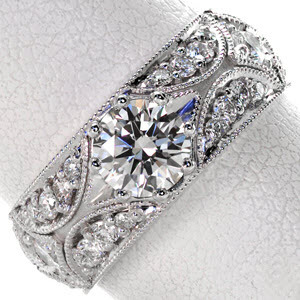 It features distinctive bead-set side diamonds at the bottom of the setting along with a flared row of micro-pave diamonds on either side of the center stone. Of course hand-rolled milgrain edges finish off this Edwardian piece. The allure of a perfectly proportioned cushion halo will grab most customers that are looking for an antique style engagement ring. There's something about this vintage look that's pleasing to the eye and not overwhelming. Of coure that's partly due to the soft lines of our Cushion Cut Engagement Rings. Our Diana features a decorative beaded edge with rows of bead-set diamonds that shimmer from every possible angle. We've laid 8 hand-wrought filigree curls in the sides and left a nice little bezel-set surprise underneath the halo. Decorative relief elements finish off 3 sides of this style while a subtle split-shank flows into the soft cushion halo. 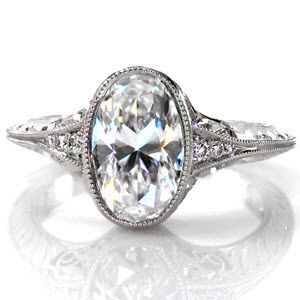 The symmetry and sparkle of this engagement ring rounds out our top 5 engagement rings in Minneapolis for 2016. It is one of the most popular Micro Pavé Engagement Rings at Knox. North Star has an unmatched ability to shimmer in any light given its unique contrast of geometric shapes and reliefs. There are 4 brilliant diamonds in each of the star shapes, from which its name was given, along with 4 superbly set micro pavé stones in the crescents. The width and low height of the North Star are two unique attributes sought after by the practical and eclectic. Its non-hollowed heavy shank is telling of its heirloom quality. This piece truly makes a statement!